The year 1973 was a generous one when it came to major cases and UFO landings in different parts of the world, but Mexico in particular, where even the city’s airport managed to pick up these unidentified flying objects. What is interesting about this is that regular commercial airline flights did not fly over this community. As regards the “extraordinary speed of the UFO”, to which the news item makes reference, the fastest airplane in the world at the time was the Concorde, which obviously did not fly over Mexican territory. In turn, the people who reported the event were largely engaged in farming activities, gaining nothing at all from making up stories about strange objects in the sky. The following UFO sighting was made known by the El Mexicano newspaper concerning a possible close encounter of the third kind (CE3K) as classified by Dr. J. Allen Hynek. It took place in El Parral, Chihuahua. According to the story, on the night of 14 March 1973, two brothers – Juan and Rubén Hernández – were working at a mine known as “La Prieta”, located in Parral, Chihuahua. Suddenly, the saw a round thing in the sky, looking like a fireball or a reddish light that appeared to be observing them. One of the miners who witnessed the UFO subsequently reported that the object was hanging there for a few moments, motionless, as though spying on them, watching the goings-on in the mine. It subsequently gained speed – which they considered to be incalculable – until it vanished from sight. In response to questions posed by reporters from the aforesaid newspaper, miner Rubén Hernández stated that “the thing” had flown away swiftly toward the Zone of Silence, and that some of his co-workers had managed to see strange lights that descended or vanished in the air on several occasions. The story about the sighting in the skies over Chihuahua was still hot in the press when another event became known – one that had occurred a few months earlier in the state of Michoacán. The exact date of this occurrence was set in the month of February 1973, according to the newspaper that made the information known. It took place on the road leading from Uruapan to Paracho in the state of Michoacán. Sales agent Alfonso Pulido claimed having been overtaken by a “ball of light” after leaving Uruapan. According to Pulido, he was at the wheel of a Datsun automobile and accompanied by Leonardo Valdéz, who in turn corroborated the information provided. Several different cases were reported during the month of May throughout the Mexican Republic, among them the case involving a truck that burned while transporting asbestos sheeting and bags of cement (widely discussed in issue 31 of REPORTE OVNI magazine). 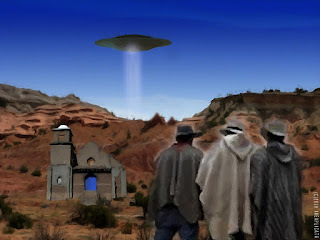 On May 9, a Sinaloa newspaper reported the following: “They claim that a flying saucer followed them. What were they smoking? (News writers often took a skeptical slant, providing such headlines to UFO related information). “Los Mochis, Sinaloa, May 9, 1973. Manuel Ruelas de Palomares and Martín Antonio Luque, peasant farmers of the locality of “El Aguajito”, township of Heraldo de Zaragoza, had the fright of their lives this morning when they were pursued by a flying saucer, or so they say, at a place known as El Vallado. “Still in shock, the two peasant farmers appeared before the police authorities of Higuera de Zaragoza to retell the incredible event, stating that it was entirely true. “According to their story, they said that on that day (9 May 1973), the time being three o’clock in the morning, approximately, they were coming from the fishing grounds in a mule-drawn cart. At a place known by all as “El Vallado”, they saw that a large flying object was heading toward them, giving off a bright yellow light covering over two meters. The peasant farmers stated that the ‘flying saucer’ approached them until they were bathed in its light, taking off at a dizzying rate of speed only to fly back toward them. Unable to endure this, they broke into a run, deserting their cart and plunging into the dense vegetation. Vidal Costa Valdéz, who held the role of trustee of Higuera de Zaragoza, reported to the area to confirm the story. Cota found the men’s footprints as they headed into the wilderness. He also found some of the fish that had fallen off the cart during what appeared to have been a desperate escape. The information, along with some cases researched in-depth by the authorities, was made known to Santiago García, a 70s-era UFO researcher. Publicado por Terra Incognita en 10:24 p. m.